Sony took a rather practical approach to display upgrades for the Xperia XZ2. The new, extra-tall aspect ratio is quickly becoming an industry standard, so ignoring it wouldn't be a wise marketing decision in 2018. The extremely polarizing notch trend, as well as some other traits, like curved edges, are a lot less uniformly accepted at this point, so we are really glad Sony steered clear of those. The 5.7-inch panel on the XZ2 is also, arguably sensible in other ways, like the FullHD+ native resolution. Even at that diagonal, that still adds up to a perfectly sharp 424ppi. Plus, Sony's LCD science has come a long way. Loyal brand fans still swear by their proprietary tech like the Triluminos display and the X-Reality Engine. 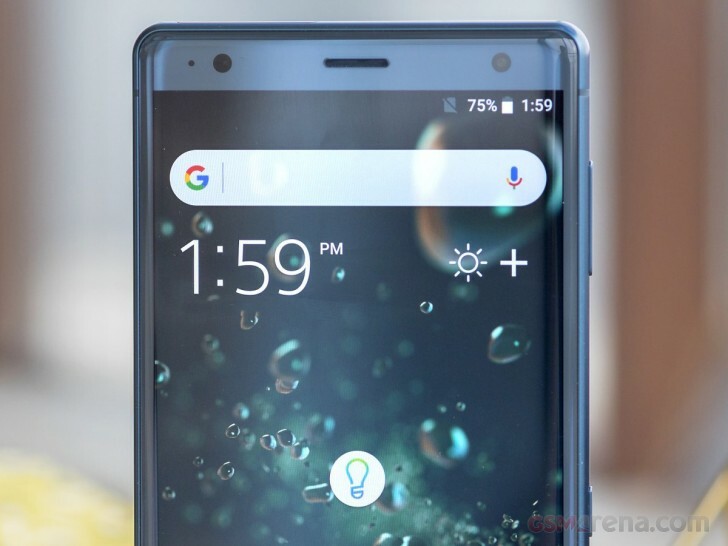 In keeping with Sony's strong display performance history, the Xperia XZ2 gets pretty bright, reaching a maximum of 618 nits. Blacks are still a bit brighter than we would like, which ultimately makes for a solid, but not impressive contrast ratio. Sunlight legibility is nothing to phone home about either, but we never really felt like the XZ2 was struggling with outdoor light, so we guess it's fine as it is. But probably the biggest display upgrade on the XZ2 is the HDR support. The panel supports 10-bit colors and is certified for the BT.2020 standard. Frankly, determining how that correlates to other industry standards, like HDR10 video is a bit difficult and needlessly technical. In practical terms, all that really matters is whether content vendors, like Netflix, enable their HDR content for the XZ2. For now, the best way for early adopters to take advantage of the HDR panel is by watching the compatible 4K HDR clips captured by the phone itself. Sony also offers an automatic upconversion system, as part of its "Advanced X-Reality for mobile" engine. It takes SDR video content and seamlessly tries to upconvert its colors to HDR levels during playback. If you've seen an HDR TV attempt to do the same, you probably already know that it looks great on cherry-picked demo videos. Real-world usefulness depends strongly on your content. You can probably expect to salvage some detail in shadows and fix some light smear in low-light shots, but it can't do miracles. If the data isn't there, it isn't there. Since the SD to HDR system didn't trigger for our standard display test setup, we can't say how much colors would have improved as a result. The LCD panel on the XZ2 is surprisingly well-calibrated against the DCI-P3 color space, which we typically test against. The default Standard color mode gives an average deltaE of 4.4 and a maximum of 8.5. No matter how much we tried, whites and grays always retained a certain level of blue tint. Switching to the professional color mode brings that down a bit, but it was only after fiddling with the custom white point adjustment that we managed to get an average deltaE of 2.9 and a maximum of 5.1. The settings we used are as follows. Of course, not everybody strives for color accuracy on their phones. In fact, the vast majority of people seem to prefer punchy, vivid colors. If that is you too, go for the Super Vivid setting. The Xperia XZ2 comes with a bigger battery than the Xperia XZ1. Still, we couldn't shake off the feeling they could have fitted an even bigger one. After all, the recent Xperia XA2 measures 142 x 70 x 9.7 mm and gets a 3,300 mAh battery. The Xperia XZ2 is 153 x 72 x 11.1 mm and comes with a smaller 3,180 mAh battery in its belly (or rather under the hump on its back). And that's without even looking outside camp Sony. Sure, flagship internals come with their own size and heat design considerations. Still, all of here agreed that it's reasonable to expect a bigger battery from a chubby smartphone like the XZ2. Still, like we've repeatedly said in the past, it's not about the amperes, but rather how well you make use of them. We have to hand it to Sony and the new, efficient, 10nm Snapdragon 845 chipset. The combination of Android Oreo and the all-new 10nm Snapdragon 845 chipset has resulted in a great 88-hour endurance rating for the Xperia XZ2. This is especially impressive, considering the 3,180mAh battery capacity. Breaking down the numbers a bit, we can see that screen-on tasks are the weakest link in the equation. Still, 11 hours or so for Web browsing and local video playback are solid scores. Plus, there is only so much software optimization can do when the sizeable 5.7-inch, LCD of the XZ2 is shining away. Talk time also falls within expectations for a battery pack of such size. The real secret sauce, so to say, is in the excellent standby endurance. 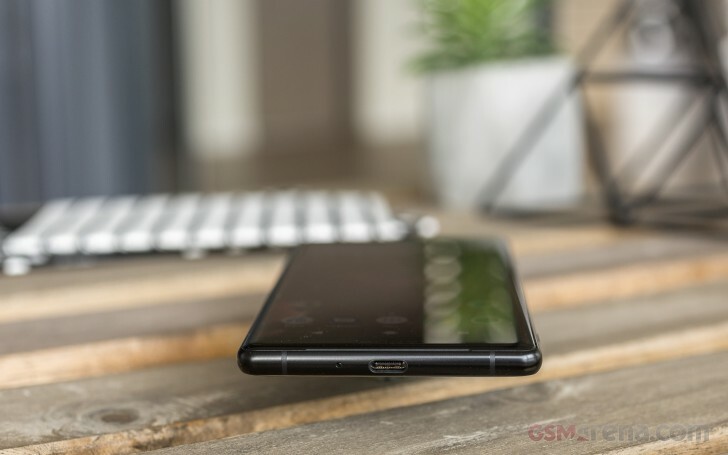 Sony has a solid track record in this department, and the XZ2 does not disappoint. If you are a light user and your phone spends most of its days in a pocket or on a desk, you can easily expect to go a couple of days without a top-up, if not more. The phone supports Quick Charge 3.0 and even though it doesn't come bundled with a fast charger in every market, using the fast charger we had brought the battery from 0% to about 45% in half an hour. Unlike its little sibling, the XZ2 also supports QI wireless charging. That won't be nearly as fast, though, even though it uses the fastest possible 9W charging. As on all its other phones, Sony has equipped the XZ2 with Qnovo Adaptive Charging and Battery care to help prolong the life of the built-in power pack by carefully controlling charging parameters. While on the subject of charging, Sony promised it would bundle the XZ2 with one of its EC270 Y-type adapters, so users can charge and listen to music at the same time. While we didn't get one of those with our review unit, we can only assume Sony will be sticking to that promise for end users. So, it's only fair we point out that the adapter comes with a caveat - it doesn't support Quick Charge. On a different note, it is also not compatible with some older Sony noise-canceling headphones, like the MDR-NC31EM and MDR-NC750. 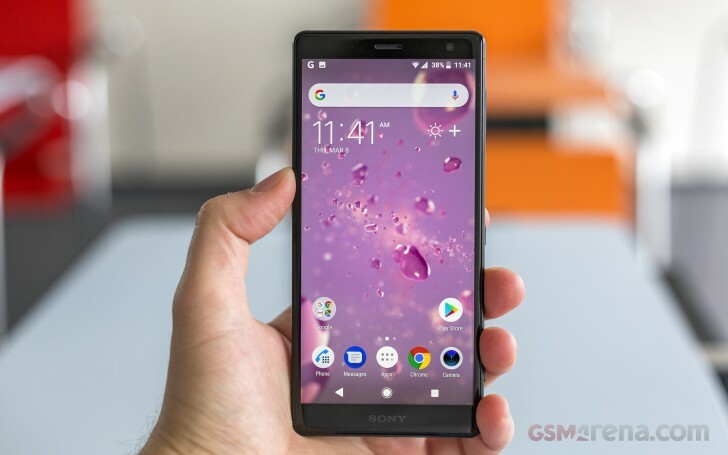 Our endurance rating denotes how long a single battery charge will last you if you use the Sony Xperia XZ2 for an hour each of telephony, web browsing, and video playback daily. We've established this usage pattern so our battery results are comparable across devices in the most common day-to-day tasks. The battery testing procedure is described in detail in case you're interested in the nitty-gritties. You can also check out our complete battery test table, where you can see how all of the smartphones we've tested will compare under your own typical use. Like we already mentioned, Sony still managed to fit a good stereo setup inside the new XZ2 body design. In fact, it is one of the better ones we have seen. Our tests can mostly confirm Sony's claim - the stereo speakers are about 20% louder than the XZ1. But volume alone does not make for a great multimedia experience. For that, you need clarity, which the XZ2 has plenty of as well. Sony's S-Force system unsurprisingly falls short of the magical and kind of self-contradicting PR promise of "Front Surround," but it does make for a vibrant soundstage. 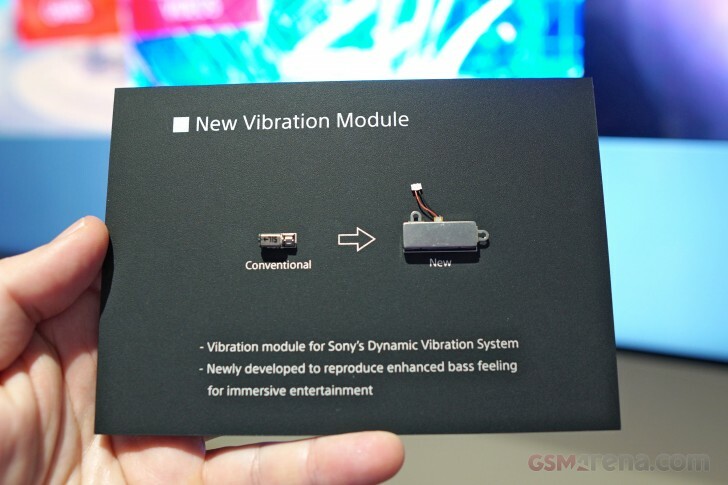 Then there is Sony's new Dynamic Vibration System. The name is pretty self-explanatory, and on the surface, it seems like a very obvious thing to do - pick up the low-frequency sounds and vibrate the phone accordingly. Still, it makes you wonder why other manufacturers have not implemented such a system yet. Digging deeper into the matter, revealed that quite a bit of engineering effort has gine into making this possible. To make the haptic feeling convincing enough to be regarded as an actual experience-upgrade, rather than a vibration nuisance, disrupting your multimedia, an advanced vibration engine had to be developed. The actuator in question is not only quite powerful and beefy (probably why it is absent from the XZ2 Compact), but it can also actuate at frequencies all the way down to 100Hz, while most phones only go to 160Hz or so. While we can't say with certainty that we can feel the extra Hz range in questing, what we can attest to is that the Dynamic Vibration System is no simple vibration. The haptic feedback feels quite natural once you get used to the sensation. Bass-rich movie scenes become that little bit more exciting and your favorite tracks now cater to another sense. The effect can be toggled on and off, as well as adjusted in intensity on a per-app basis, which is even better. Especially if you don't find it to your liking for multimedia. Then you can still leave it on for notifications, which Sony claims become more apparent. The Xperia XZ2 represents a big step forward for Sony when it comes to audio output. In previous years the Japanese company’s flagships have been a step behind their rivals, but this time around we were treated to a performance worthy of a flagship. When hooked to an active external amplifier the XZ2 delivered above-average loudness and perfect clarity as befits its standing. Plugging in a pair of headphones dropped the loudness to only average, but the accuracy of the output didn’t get damaged. The hike in stereo crosstalk was well contained and while some intermodulation distortion did creep in, it’s nothing you will notice without dedicated testing equipment. All in all, the Xperia XZ2 delivered a solid performance with no major weak points whatsoever.